Kent Science Park celebrated national Liftshare week by encouraging staff onsite to share their journey to work, and saw a sizeable increase in the number of employees doing just that. After site-wide promotion of the day to persuade as many people as possible to share their commute on the 5th October, nearly 200 people ended up sharing their journey to the site – which represents 15% of the Park’s total workforce. Everybody who shared on that day was given a ticket, which was entered into a prize draw to win £250 in cash, with two runners up prizes of £25 each. The winning ticket belonged to Amy Palmer of GoResponse, who spoke about why she decided to share her journey to work and winning the £250. “Here at KSP we’re determined to do our part for the local environment, and to do our best to keep our local roads as clear from congestion as possible – it’s difficult but we have to make the effort. It was a real achievement to see such a significant increase in people sharing their lift to work on Friday, and I hope that those new to sharing use this as an opportunity to start sharing their journey more regularly. 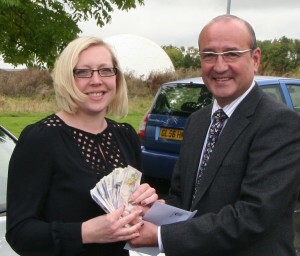 Photo:Amy Palmer receiving her prize from James Speck.